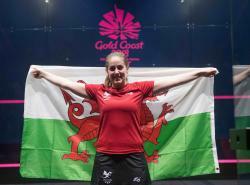 Tesni had reached the semi-final of the Women’s Singles in spectacular fashion, beating Laura Massaro of England in straight-games and recording a second comprehensive victory over the former World No. 1 following her win in the final of the National Championships in February. Despite losing in the semi-final to Sarah-Jane Perry of England, Tesni managed yet another upset in the Bronze medal match by beating Nicol David, a two-times Gold Medal winner at the Games and a certified legend of the modern game. In addition to adding to Wales’ current tally, Tesni’s victory adds a second medal for Bangor, following Gaz Evans’ weightlifting Gold earlier in the Games.